GM wants 1.8bn euros to help Opel. MUNICH -- General Motors Europe President Carl-Peter Forster and other senior company executives met with German Chancellor Angela Merkel today to discuss the future of GM's Opel brand. No decisions over Opel are expected immediately, a government spokesman said. "The meeting covers solely developing information. Decisions will not be made," spokesman Ulrich Wilhelm said in a statement. Opel is seeking 1.8 billion euros ($1.93 billion) in loan guarantees from the German federal and regional governments in case its U.S. parent GM falls into bankruptcy. 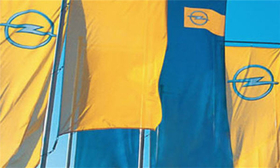 Forster, who is chairman of Opel's supervisory board, was accompanied at the meeting in Berlin by Opel Managing Director Hans Demant and Klaus Franz, chairman of Opel's works council. Following a morning meeting with Merkel, the Opel delegation planned to meet German business minister Karl-Theodor zu Guttenburg in the afternoon. Sweden´s Prime Minister Fredrik Reinfeldt today said tthat his government will not give any loans to GM subsidiary Saab. “Swedish taxpayers cannot take over responsibility for the future of Saab,” Reinfeldt told the TT news agency in Stockholm. According to media reports, GM has asked for $600 million (466 million euros) in credit guarantees for Saab, which is based in Sweden.